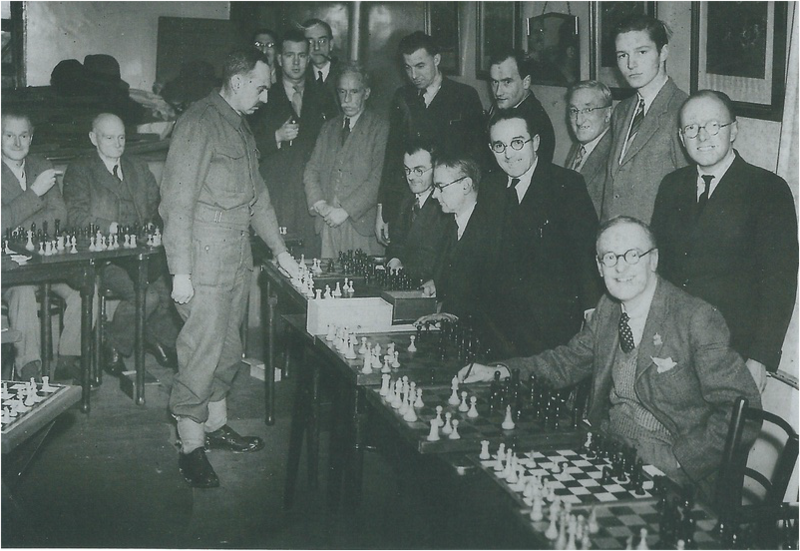 Andrew Keil has been given this picture of Bognor Chess Club, dating back to 1944-45. This is when the club played at London Road Conservative Club. The only names we have are as follows: From left, 2nd left, standing, Joe White, greengrocer, London Road; 4th left, standing, Mr K ….. teacher, Chichester High School (Boys) and 9th left, standing, Charlie Purley, founder, LEC Refrigeration. If anyone can fill in any of the gaps, we'd be pleased to hear from them. The South West Sussex League was founded following a meeting between representatives of local clubs which took place at the Crown Public House at Littlehampton in October 1974. Seven teams of 5 players competed in the first league competition, held over the season 1974/75. A 150 maximum individual grading limit was imposed. The initial 7 teams were, it is thought, Arun, Barclays Bank, Beechams, Bognor, Boundstone, Chichester and Worthing, with Worthing being first winners of the Competition. The Competition was a success and, in the early years, went from strength to strength. A Jamboree event was inntroduced in the second season and the individual grading limit was increased to 160, and subsequently abandoned altogether as the inter-club competition format was becoming more popular with more and more players wishing to participate. A total team grading limit, now 650, was retained. 8 teams entered in the second season, and by the third season in all different 90 players were appearing in League events. From the 1981/82 season onwards, the adjudication system was scrapped in favour of the present time limit and allegro finish. In 1976 the SWSCL challenged the Mid-Sussex League to a match and won 6-4. This event became an annual fixture for some years. During the early 1980s similar inter-league matchers were played against the Portsmouth League, and the Hampshire Junior team. This year approaches have been made to try to revive these inter-league matches and we are hopeful that our challenge will be accepted ! Other highlights were simultaneous displays by David Arrnstrong (1979), Sheila Jackson (1984) and Tony Kosten (now a Grand Master), in 1989. Over the years the following teams have played in the league: All Stars, Arun, Arun Juniors, Barclays Bank, Beechams Sports & Social Club, Boundstone, Bognor, Bognor & Arun, Chichester, Emsworth, Ford Prison, The Gambiteers, Lloyds Bank, Rustington, Westergate, Worthing and Worthing Juniors. The early years were domiinated by the Worthing area clubs, but the tide started to turn in the late 1980s when Bognor & Arun, Chichester and Rustington each gained first successes in the league, and in recent years although there have been some very tight finishes with Emsworth and Rustington in contention, Bognor & Arun have dominated. Notwithstanding that its chess tradition is maintained in a small but lively chess club, Bognor Regis is best known today for a reputed profanity uttered by the dying George V. Few of us remember that in the fifties and sixties it was a regular stoppping-off point on the British tournament circuit. Bognor's debut congress was held in May, 1953, and attracted a modest total of 64 entries. (A few years later the entry would top 400, an estimated £80,000 worth of business having accrued to the town from its first twelve congresses.) Even so, the Premier section attracted some well-known names: 1952 British champion Bob Wade, Harry Golombek, William Winter, the South African Wolfgang Heidenfeld (author among other things of the idiosyncratically named Busts I), and Chess Ltd's own Barry Wood, all of whom competed fiercely for the £30(!) first prize. At the start of the last round Wood and Winter were leading with 4.5 points out of 6, but in a decisive shoot-out with Golombek the Chess editor played incautiously, turnning a probable win into a loss. Maybe his thoughts were in Sutton Coldfield, where the next issue of his beloved magazine was about ready to be put to bed. Bognor's inaugural congress was agreed by all to have been a success, the various sectional tournaments being diversified with lightning and kriegspiel tourneys and with simuls by Bob Wade and Barry Wood. Not that everything ran quite as smoothly as the organiser, Norman Fishlock-Lomax, might have wished. One local newspaaper reported that Fred Hill, a chemist from nearby Middleton-on-Sea, had to come up with 'a bell metal pestle and mortar' at short notice, when an electric buzzer for a lightning tournament failed to deliver. While I was on the website, I noticed that there was a history section displayed there. I found the article on the South West Sussex League by Philip Wake to be very interesting. There was also a section on the congress at Bognor. I remember quite well Norman Fishlock-Lomax, who gave me a lot of encouragement, when I was a junior player. One day, I was to play him at his home in the West Sussex Queen competition and I imagine that a few eyebrows were raised when a Rolls Royce of his arrived on our council estate ready to give me a lift! On another occasion, he arrived in a Jaguar! The article by a gentleman named Andrew seems to suggest that the Bognor congresses (1953-69) represent early chess history in Bognor. However, chess in the town appears to have started about 60 years before that. I thought that you might be interested in a brief history of your club. I have only taken it up to 1982, so perhaps someone, who is at present in the club, might like to add something about the last 30 years or so in the club's history. Before the 1890s, Bognor chess players would probably have travelled to Littlehampton or Chichester to join a chess club. In 1891, however, the Sussex Chess Journal stated that an effort would shortly be made to form a club in Bognor. A strong Sussex player, William Bridger, gave a simul in the town, but there is no evidence that a club was formed at this time. The Sussex Chess Archives refer to a club existing in Bognor in 1893, but this is not corroborated by any other known evidence. However, in September, 1898, a chess club was definitely formed in the town. The venue was the Reading Rooms in Lennox Street and in December of that year a friendly match was played against some Chichester players. Early in 1899, another friendly was played against the Lodsworth CC and at that time there was reported to be a membership of 30. Another fixture aginst Lodsworth was arranged for January, 1900, but after that there seems to be no evidence of the club being active. The next Bognor CC was formed on February 21, 1913, when five keen members held a meeting in the Webster and Webbs Reading Room in Lennox Street. The club moved to 47 High Street later that year and the first general meeting was held on April 30, 1914, when a constitution was drawn up. There was a good attendance which held out promise for the future. These hopes were dashed by the advent of World War I. In November, 1914, the club lost a match against Worthing by 5 games to 1 and it became a struggle to survive at a time when many clubs went under. By 1916, the club had nine members, of whom only about four regularly attended the weekly meetings, but somehow the club managed to keep going. In 1920, the Bognor CC started to revive and on October 7 of that year, a meeting was held at Bank House (Westminster Bank) at which a Mr Goldsworthy, a tea room proprietor, offered accommodation at his premises. Following this, the club enjoyed a new lease of life. By 1921, the membership had increased to 19 and in 1923 friendly matches were played against the Chichester Red Triangle CC. In 1923 or 1924, the Bognor CC moved to the Bijou Café in York Road, but it appears that interest in the game began to wane in the area. The reasons for this are uncertain, but the club held its last recorded meeting on October 3, 1925. In 1932, the existing Chichester CC decided that it would be a good idea to form a combined Chichester and Bognor CC. 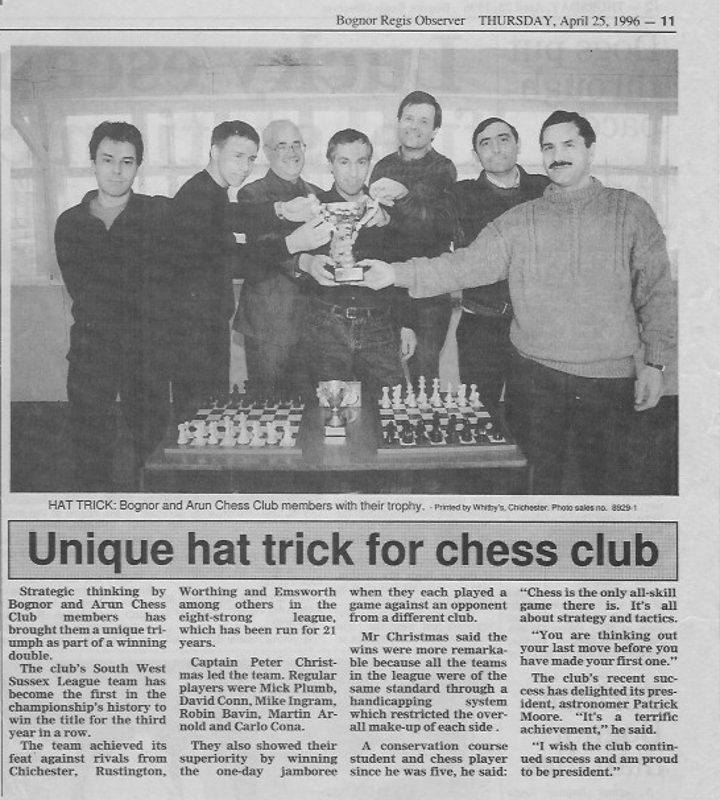 and the Chichester Club offered to share its assets with the Bognor chess players. An arrangement was made by which weekly meetings were held in both Bognor and Chichester. The amalgamation proved popular and successful and a team was regularly entered in the McArthur Cup. It is also recorded that in 1934 a 12-board friendly was played against the Portsmouth CC. In 1937, the Chichester branch of the club had a distinguished visitor. The well-known Belgian player George Koltanowski provided a boost to chess in the area when he gave a 10- board simultaneous. When World War II started, chess continued to flourish in Bognor, but declined sharply in Chichester. The Bognor players were fortunate in that the rent that they paid to the Conservative Club in London Road was reduced. At the end of 1940, and early in 1941, a former British champion, William Winter, who happened to be stationed in the area, gave two simultaneous displays and refused to claim a fee for himself. Instead, the donations were sent to the Red Cross organisation and the ‘Post’ Spitfire fund. In 1942, the Bognor section had probably its youngest champion when 16-year-old Brian Honnor won the title. For a while after the war, contacts between Bognor and Chichester players were maintained, but before the end of the decade Bognor had established a separate identity. A new Chichester CC was formed in 1952. The 1950s proved very successful for the Bognor CC. On four occasions the club reached the final of the McArthur Cup, but just could not lift the title.There were also a number of visits by Harry Golombek to give simultaneous displays and one by B H Wood. In 1954, the club started to enjoy spacious accommodation at the Terminus Hotel, Station Approach. In 1958, the club came close to having its first county champion when A Ayriss lost in the final. Meanwhile, in the middle of the decade, a second club was formed in the town, in connection with the LEC Refrigeration Company. It entered the McArthur Cup in the 1956-57 season. In 1961, the Bognor CC had another player, who reached the county final in W.C. Kendal. In the McArthur Cup, however, the club was less successful as the rival Worthing CC received a surge in popularity. One very promising young player, Maurice Staples, would have been a real force in Sussex chess, but in 1968 he moved out of the area. The last mention of the LEC club that I can find dates from 1961. In the 1970s, the Bognor CC benefited from the experience of Bert Philpott, a strong player. When the South West Sussex League started, the club entered three teams in the first competition. In 1975 a team from Bognor College also entered the competition. In the early 1980s, chess in the town changed dramatically. Many years had passed since the dynamic Norman Fishlock-Lomax had organised annual congresses in the town and, though the Bognor CC remained a stable club, it seems to have been largely unaffected by change. It may, therefore, have come as a surprise when a different type of chess club started up in the town. A newly-formed Arun CC was formed around a group of promising young players. The inspiration behind the sudden upsurge of interest among the younger generation was Peter Barton, a teacher at the Westergate School. He himself lived in Bognor and at the first meeting of the Arun CC in August, 1980, 30 people turned up. It was not long before this new club had entered two teams in the South West Sussex League and in the 1981-82 season it competed in the McArthur Cup. One effect was that it drained some members away from the main Bognor CC. One particular junior, Mandy Hepworth, came to notice. In the British championships at Brighton in 1980 she came first equal in the girls under-14 competition. Peter Barton also organised some external competitions and from 1981 for a few years he organised young masters’ tournaments at the Westergate School after receiving sponsorship from the Amey Roadstone Corporation. he Arun CC held its second AGM in May, 1982. By that time amalgamation with the Bognor CC was already being talked about and after a few meetings the first amalgamation of the new combined club, the Bognor and Arun CC, was held on September 3,1982.